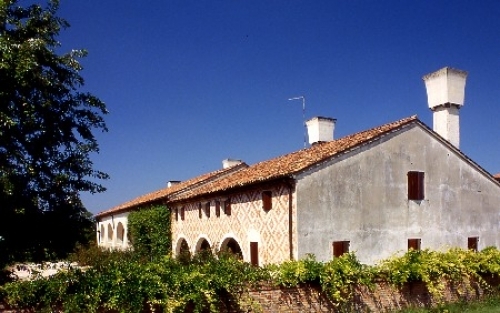 On the way from Meolo to San Donà di Piave there is Vio House, with its beautiful decorated façade, according to an old typical pattern from the latest 15th century, which was still followed in this area - and particularly in the Treviso surroundings - till the beginning of 16th century. The decoration is made up by false red and white bricks, placed as lozenges, with crosses inside them, and reminds of the splendid marble decoration of the 'Palazzo Ducale' in Venice. Under the porch of the façade there are frescoes representing figures of Saints and of St. Marco's Lion. Because of these religious pictures and of its architectural typology it must be excluded that Casa Vio could be a patrician residence and certainly could not be a rural house either, but rather the guest quarters of some monastic order.